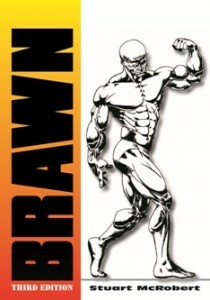 BRAWN is the classic guide that started a bodybuilding revolution. It’s Stuart’s first title, and focuses on genetic realities, appropriate role models, and most of the ins and outs of successful training. It’s especially strong in the philosophical underpinning behind rational training. It also details how the genetically blessed are gifted, and shows why conventional training methods are so unproductive for typical bodybuilders. BRAWN is now in a 230-page, third edition. There are millions of people slaving away in gyms today who are living testimony to the utter futility of conventional bodybuilding methods. Many of these misguided trainees are walking encyclopedias on everything related to bodybuilding except that which will actually make them bigger and stronger. Stop wasting time on routines that don’t work. It’s time to apply instruction that’s designed for people like you. The philosophy you need to ensure your bodybuilding success. What to expect for your ultimate size and strength gains—how far you can push your genes. The specifics on genetic variation and how this relates to the design of all your training programs. How the bodybuilding masses have been deceived and cheated BIG TIME! The why and how of intensity cycling, for year to year bodybuilding progress. Proper and effective set and rep schemes. How often you should train for maximum gains. Training routines for you to follow. How to individualize your bodybuilding routines for continual improvement. How to avoid the curse of overtraining. How to eat for training success and why nutrition ISN’T 80% of the formula. Why most food supplements are a waste of money—and how to use supplements wisely. How NOT to train like a champion and yet still build bigger and stronger muscles. The effort, motivation and dedication you need to earn bodybuilding success.